"No Other Jewelry Making Blueprint Is As Easy To Understand, Comprehensively Written & Reasonably Priced As The Jewelry Making SecretsThis Is One Bold Guarantee That You Can Take To The Bank!" EXPOSE THE EXACT INSIDER SECRETS WHICH HAVE MADE ME & SEVERAL FEW OTHERS STINKING RICHNOW THAT'S A FIRST! I have gained valuable experience that most jewelry makers can only dream aboutand now I am offering you a golden opportunitymy priceless knowledge & experience all on a silver Platter offerand all you have to do is take it! "I Earn A Minimum of $2500 For Every Piece I Design & I Make About 18 PLUS Of These Pieces A MonthYou Do The Math"
I will not promise you luxurious cars or seaside mansionsNeither will I promise you unsung wealthWhat I will promise you however is that once you purchase this recession proof, all-in-one, jewelry making blueprint you will be well on your way to quitting your day job & earning a fabulous income that most people can only dream of, guaranteed! Step-by-Step instructions on how to make exquisite & attractive jewelry that will sell anywhere, anytime. I will let you in on the insider secrets that have made me what I am todayYou will be able to do all this regardless of your jewelry making knowledge or experience, guaranteed! How to expertly decorate your jewelry & make them look attractive and stunning You will learn the fundamentals of jewelry decoration that have been around for thousands of yearsThe interesting part is that I will show you how to combine the modern & ancient decorating techniques to make your jewelry look even more elegant. How to establish yourself as a master jewelry expert I will show you how to crush your competition and establish yourself as the leading expert in the industry. Celebrities, models, sports personalities & public figures will all be flocking to you as their sole jewelry maker. How to get your pieces sold for the best price I will give you expert advice on how to sell your jewelry at extremely good prices & without having to break your bank account advertising. How to determine which jewelry pieces to design & make this is probably the hardest part for any amateur jewelry maker. Fortunately I will give you time-tested & proven advice on how to decide on the pieces to make without wasting a single cent on a piece that won't sell. Hot Jewelry making Secrets & Tricks that made me indispensiblethat's right; I will let you in on some of my most prized SECRETS that I have learnt & practiced over the past 14 yearsYes, they will all be at your finger tips! This Is As Best An Offer You Will Ever GetFrom Any Expert Jewelry Maker Anywhere In The World, Guaranteed! However what I am offering you here is not just another 'Hype' filled guideor some smart mans instruction manual, no! 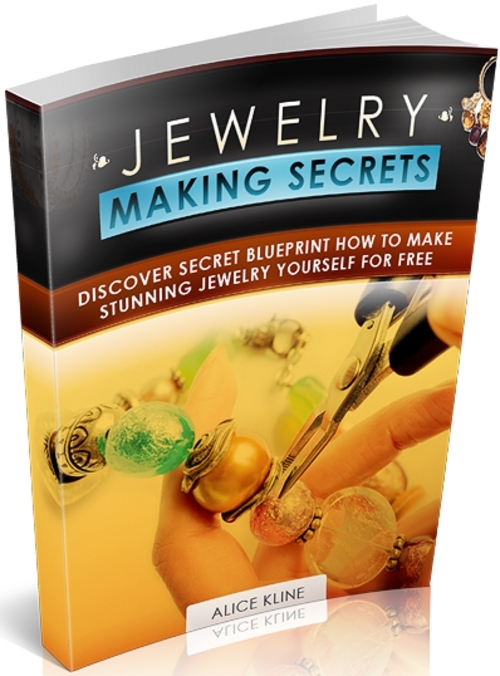 What I am offering you is a well written,top-notch, blueprint that is jam-packed with 'insider secrets' that will make you a master of the jewelry making artand I bet you would like that, wouldn't you? You are completely GUARANTEED 100 TOTAL SATISFACTION!